It is time to switch gears from Halloween to Thanksgiving! 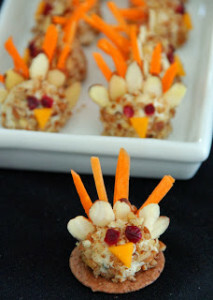 Get those kids in the kitchen to make some of these fun, no bake snacks! Head over to Joe and Sue to find the complete tutorial for Mini Cheese Ball Turkeys! My relatives always say that I am wasting my time here at net, however I know I am getting experience every day by reading such fastidious articles. divorce or break up occur even if your condition seem hopeless. These are the secrets you simply can not afford to miss at any cost.